With the increasingly critical message to reduce waste, a couple of young Kiwis founded The Rubbish Trip and came up with some easy, waste free recipes for our toiletries. 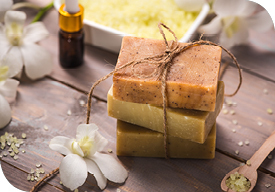 By making toiletries from scratch you are avoiding the packaging that surrounds store-bought alternatives. To keep the toiletries waste-free though, challenge yourself to source the ingredients low-waste too! Add one part baking soda to two parts coconut oil. Hannah and Liam recommend making the toothpaste in a glass jar, sitting the glass jar in a pool of hot water to melt the coconut oil, and stirring until a smooth consistency is formed. Tip: Get your baking soda in bulk from Bin Inn or similar. Opt for Trade Aid’s fairtrade, organic coconut oil, which does not have plastic wrapping. Optional extra: If you don’t like the salty taste, add in a few drops of peppermint essential oil (though Hannah and Liam have only found a handful of stores nationwide that offer a refill option for essential oil). Mix together two parts natural exfoliant (sugar, coffee, salt, oats or combination) to one part oil. If desired, add one to two tablespoons natural herb (like lavender, rosemary, mint) and/or one to two teaspoons of spice (say, cinnamon or ginger). Tip: Hannah and Liam use Trade Aid’s fairtrade organic sugar which comes in paper bags that are re-usable. Source coffee, salt, oats and spices at your local bulk store. Use fresh coffee grinds, rather than used grinds, unless you use the scrub straight away, as the water in used grinds reduces the shelf-life considerably. Remember everyone’s bodies are different so any homemade recipe may require tweaking. So tweak and find what works for you! These recipes have been developed over the last three and a half years while Hannah and Liam have been on their zero waste journey. To learn more about The Rubbish Trip go to therubbishtrip.co.nz. Hannah and Liam offer FREE zero waste presentations and workshops to community groups and schools across New Zealand on how Kiwis can reduce their waste footprint.